Let Carolinas Custom Kitchen & Bath Center in Huntersville, NC Customize Your Kitchen With A New Kitchen Island Or Kitchen Bar! Kitchen Islands & Bars – At Carolinas Custom Kitchen & Bath Center, we do more than just kitchen and bath remodeling. We have a wide variety of custom cabinetry ideas that can transform a room with a stunning focal point. Many of our Huntersville, North Carolina customers have recognized that installing a kitchen bar or kitchen island in their home would not only be stylish, but provide useful storage, as well. 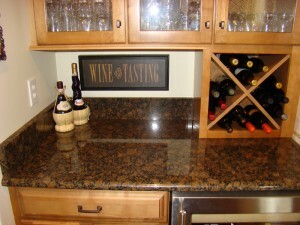 The best part about kitchen islands & bars is they can be as simple or as extravagant as you would like. Whether you’re looking for a little extra preparation space with some storage or you want an impressive bar installed for your home theater, our designers can help find your perfect fit. Our hand-crafted cabinetry will look elegant and functional in your home. Let us show you all our options for installing kitchen bars and kitchen islands in your home by stopping by our Mooresville location or contact us online.